Slowing down the pace of things. . .
It’s back to school time, with the crazy schedules and hectic pace that it brings. I experience this both as a parent and in my job every year, yet every year it always seems to sneak up on me (and my family!) in a not-so-gentle way. Can you relate?? I haven’t written a blog in awhile. Life did what it does, where unexpected things happen that can really derail us. It’s been one of those times for me so I’ve had to dig deep into my ‘toolbox’ to find the tools to move through it all. This process has really impacted the mom and the therapist in me and made me reflect more on how my kids are doing through this back-to-school phase (both my own children and my clients). Do they feel the hectic pace? Are they struggling to settle into new routines and schedules? Are their brains and bodies ‘ready to learn’ each day? What thoughts/feelings/struggles are stuck in their mind that might make learning (or just getting through the day!) more difficult? Mindfulness. It’s a big buzz word right now, isn’t it?! There are many definitions out there but one I like comes from Cambridge Dictionary which is, “The practice of being aware of your body, mind, and feelings in the present moment, thought to create a feeling of calm.” I mentioned my toolbox earlier and for me, that includes many different mindfulness practices. I’ve dabbled in this world for over a decade but have found it much more necessary and fulfilling in the past few years in my own personal life. As I grow and learn in this area every year, I’m also understanding the great importance in teaching or modeling these ‘mindful’ strategies to our kids. This world isn’t slowing down anytime soon so I wanted to share some resources and ideas on how to help our kids (in our homes, classrooms or therapy rooms) to calm their minds and just be in the now. 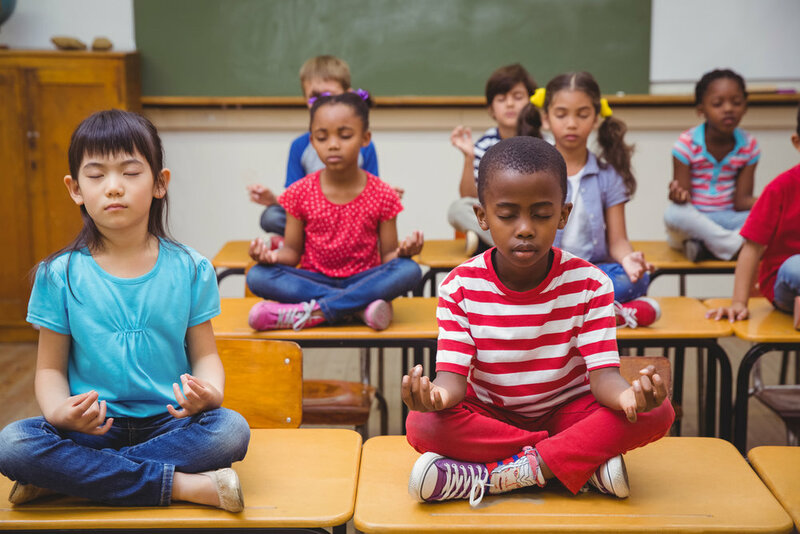 I started thinking more about kids and mindfulness, as I began to incorporate mindfulness into my own daily life. As I’ve paid more attention to my own thoughts, feelings and stressors and how they’re impacting my interactions with the world, I think more and more about how these things impact my kids (both my sons and my clients). I’ve begun to shift my perspective a bit on what path I can/should take to help my kids reach their goals. As a speech pathologist, we are trained to be very GOAL oriented, evidence-based and data driven. But what I’m finding, is that your therapy goals and the very best planned interventions go right out the window when our kids feel stressed, pressured or overwhelmed. What I’m also finding is that our kids often don’t have the awareness and communication skills to explain what’s going on inside. So how can we, as parents and professionals, recognize this and help them navigate our increasingly busy and hectic lives? We’re doing it all of the time but how often are we mindfully doing it, slowly and with attention and intention? There’s science behind this one. A lot of it. . . that shows what slow, deep breathing does for our nervous system (see article in Psychology Today). Maybe before launching into homework with your child (I need reminders on this one!!) or starting your lesson or therapy session, you close your eyes and just breathe for a minute. Calm the system. Reset. Sometimes a visual or tactile tool can help kids elongate their breath, like a Hoberman Sphere or putting hands on the heart and belly to feel them rise and fall while you count to 5 on the inhale and 5 on the exhale. Kids sit a LOT in a school day and often don’t get the opportunities to move like they need. I will often see the restlessness and lack of focus in sessions and when I do, I just stop what we’re doing. We get up and we move. It could be 3 minutes of yoga postures like a basic sun salutation or a tree balance to work on balance. It could be a ball or beanbag activity where we’re crossing the midline (Brain Gym is a great program dedicated to using movement to optimize learning). I’ve also really loved seeing classroom teachers use GoNoodle for quick breaks throughout their day to get kids up and moving. They have free online accounts and I’ve also used it at home The point is that movement, even just a few minutes, can help to calm and reset our kids’ brains. It can get them ‘ready to learn’ again in the midst of a stressful day. I recently read a great presentation by another speech pathologist, Susan Hendler Lederer, PhD, CCC-SLP, who had wonderful suggestions for incorporating mindfulness into our therapy. She talked about the importance of teaching kids about their brains and how our busy, thinking brains affect our bodies and feelings all of the time. I loved her analogy/story about the amygdala (controls fight, flight, freeze) and prefrontal cortex (our ‘thinking’ and decision making center). She described the amygdala as the ‘guard dog’ and the prefrontal cortex as the ‘wise old owl’. If the guard dog is standing outside of the doghouse on high alert, ready to pounce, the wise owl can’t make good decisions. So the guard dog needs to be at attention but not ready to fight, so that the owl can think. I absolutely loved this visual for kids and its ability to simplify and explain the most complicated structure in our bodies. When our kids get stressed, it’s obvious because they are in fight or flight mode. If our kids have this mental picture, we could ask them, “Is your guard dog out or your wise owl? What should we do to help our owl come out?” We teach them about their brains and then, maybe, model a few calming strategies to help them reset. As a parent, I’m constantly reminding myself of the importance of modeling these behaviors. Take a deep breath instead of yelling in the moment, meditate and move in the morning to set the tone of my day, and most importantly let my kids see me doing these things. As we think about teaching our kids about this rather abstract topic, there are also many great books to help teach mindfulness to kids. Here are just a few but there are truly so many resources now that I wish I had when I was young! Just google ‘mindfulness books for kids’ and you’ll be amazed at what pops up. What I’m talking about here is not a pass/fail or mastery kind of thing. It’s so important to remember that. Being mindful, taking a needed pause, moving your body in a way that feels good are all part of a lifelong journey (at least they’re a part of mine) to get more intune with our inside selves and less distracted by the outside world. I think of it as a way to ‘slow down the mechanism’! I’ve just barely scratched the surface on this topic but I know that some days it’s easy and some days, as the saying goes, ‘the struggle is real’! At the end of the day, though, I think about the kids in my life and wanting to give them every tool to succeed in life. I know that if my son doesn’t finish his math homework or my client needs less language instruction and more time to breathe or move, then that is OK. It has to be. Life might be zooming by us but I’ll continue to do my best to keep myself and my kids from getting swept away. I hope you find some of the links in this blog helpful! Here are a few more resources if you’re interested and please share any of your favorite parent/teacher/therapist tricks for helping your kids ‘settle in’!